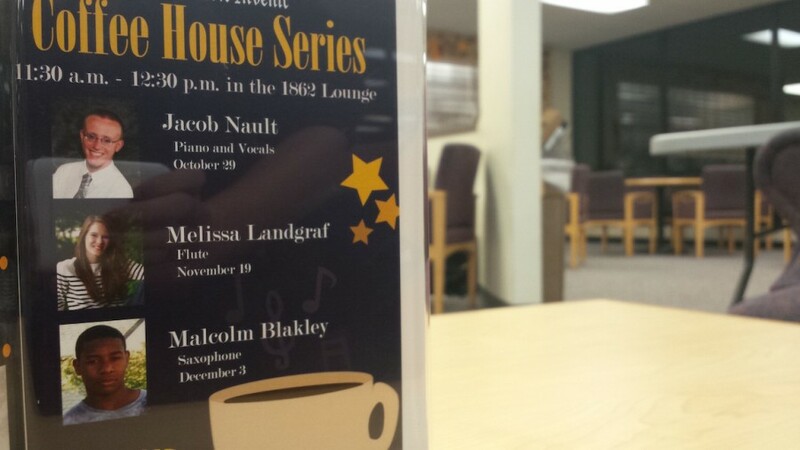 The Coffee House Series features the talents of Lakeland students who have shined brightly. The Lakeland College Student Success and Engagement Office (SSEO) will begin hosting a Coffeehouse series in the 1862 Lounge. These small, informal concerts are allowing selected Lakeland students to showcase their musical talents. Held during the day, they provide a welcome break for residential and commuter students alike. The first of the series will feature Jacob Nault on keyboard and vocals, and will take place on Thursday, Oct. 29, from 11:30 a.m. to 12:30 p.m. in the 1862 Lounge. When asked about these events, Lisa Stephan, student success and engagement coach, shared that the SSEO was looking for ways to engage students during the day and bring traffic to the lounge. According to Stephan, the 1862 Lounge has been “an underutilized space.” These concerts are part of an effort to remedy that. Members of the SSEO also wanted to give student performers opportunities to perform outside of the recital setting. Students were chosen from a list generated by the SSEO in conjunction with input from Lakeland’s music faculty. In addition to the Fall lineup, performers are already scheduled for the Spring series. On Nov. 19, Melissa Landgraf will be playing the flute, and Malcom Blakely will perform on the saxophone on Dec. 3. Grab some lunch, come listen to some great music and support your fellow Muskies.